Recently, we posted a reader’s note about a talk from the organization called ‘Nature in the City’ (NC) on the “urban forest.” (Those are NC’s quote-marks; they apparently don’t believe in urban forests). NC is the parent organization of the Mt Sutro Stewards, which backs the destructive plan to gut Mt Sutro’s Cloud Forest. These are our notes from that talk, which you can listen to here (scroll down until you find it). Given that it was positioned as “education”, we were disturbed by the strong bias as well as the inaccuracies. “A deep well of misinformation,” commented someone who heard the talk. We have to agree. NC’s Josiah Clarke kicked off with two slides: A shot of the nearly bare Southeast Farallons, and a “bunch of logs” (similar, not identical, to the pictures here). “I’m definitely not a hater of trees…” he said, noting that the pictures reflected his “background with trees”. Ravens, because they’re predators; they saw one eating a sparrow. “We’re managing for ravens” NC said disparagingly, which was odd because as enthusiastic birders, they should know that San Francisco has quite a number of bird species. Actually, NC wasn’t so keen on some native trees, either, with a reference to over-planting of redwoods in the artificial canyons of downtown San Francisco. The Callophrys Dumetorum butterfly [not the Callyphors Dumetorum as NC misspells it on their website] which NC calls the Green Hairstreak, but UC Davis calls the Bramble Hairstreak. However, Butterflies and Moths of North America refers to it as the “Coastal Green Hairstreak” and describes it as “G5 – Secure – Common; widespread and abundant” though it notes its range is limited and should be protected. NC said that the governing principle of conservation should be to preserve the “last of the least and the best of the rest.” We have no quarrel with that principle. But in fact, none of the species favored, (or even the species disfavored), fall into these categories. With the single exception of the Mission Blue. Actually, the Green Hairstreak Corridor is a good idea, whether or not the butterflies (whatever they’re called) are rare. We’re supportive of efforts to preserve nature in the city — but not by destroying it. We’re puzzled why the Nativists in San Francisco don’t work with nature rather than against it – for instance, underplant urban forests in Golden Gate Park with those native species – such as ferns – that prefer shade and moisture, rather than trying to create “sunny glades” where the sunshine is limited and toxic chemicals are necessary. We’d suggest an over-riding aphorism: First, do no harm. This entry was posted in Environment, eucalyptus, nativism and tagged birds, eucalyptus, eucalyptus myths, native plants, nativism, nature in the city, puzzled, tree killers, unscientific, wildlife. Bookmark the permalink. This was one of my first encounters with nativists in San Francisco and it proved prophetic. Subsequently, I was often called a “nature hater” both verbally and in writing. I have always found it rather ironic that those who object to the destruction of nature are accused of “hating nature.” It seems to be fundamentally backwards and it reminds me of my undergraduate introduction to psychology in which such contradictory thinking was labeled “reaction formation.” The textbook example was animal advocates who want to kill humans (animals) whom they believe are mistreating animals. Likewise, the nativists advocate for the destruction of non-native plants, trees, and birds they don’t like for one reason or another, yet they claim the high ground as the superior nature lovers. I don’t get it. I doubt that I ever will. Wow, I am really shocked to learn about the POV of Nature in the City, and appalled to discover the use of pesticides! I am actually very interested in native plants that have adapted to live under Eucalyptus, if indeed this is happening. 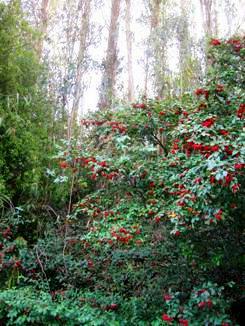 Is the Toyon under a full understory or on the edges? Are there a lot of plants? I agree that it would be interesting to try to plant native plants under eucalyptus if in fact there are some that do OK under there. It’s not inconceivable that a bird could die from the cold in a foggy San Francisco winter, if it is adapted to spending the winter in a tropical forest.. .you all know how chilling the fog can be! I’m not saying it happens though, I have no idea. As for ravens, I love them! They are incredibly intelligent and adaptable. They don’t need our help, though. They’ll be fine and probably outlive humans, regardless of which plants end up dominating the urban environment. I believe there are native plants mixed in. So far as I know, birds don’t die of the foggy San Fran summer; if they’re tropical-adapted migrants and don’t like it, they wouldn’t come here. And the fog belt is limited, so they can move outside of it.